The persistence of functional CD8 T cell responses is dependent on checkpoints established during priming. Although naive CD8 cells can proliferate with a short period of stimulation, CD4 help, inflammation, and/or high peptide affinity are necessary for the survival of CTL and for effective priming. 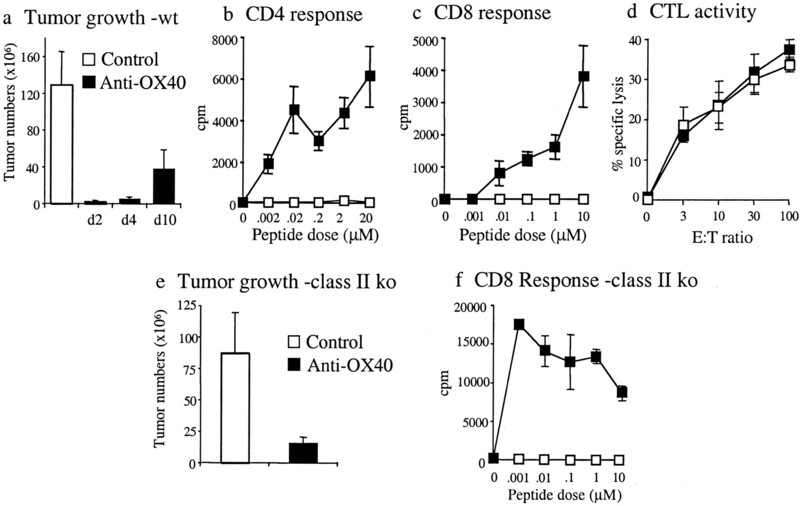 Using OX40-deficient CD8 cells specific for a defined Ag, and agonist and antagonist OX40 reagents, we show that OX40/OX40 ligand interactions can determine the extent of expansion of CD8 T cells during responses to conventional protein Ag and can provide sufficient signals to confer CTL-mediated protection against tumor growth. OX40 signaling primarily functions to maintain CTL survival during the initial rounds of cell division after Ag encounter. Thus, OX40 is one of the costimulatory molecules that can contribute signals to regulate the accumulation of Ag-reactive CD8 cells during immune responses. CD8+ CTL are important for clearance of virus- and intracellular parasite-infected cells and for suppression of tumors (1, 2). Like other lymphocytes, checkpoints exist in CTL activation pathways that most likely have arisen to prevent autoreactivity and a loss of tolerance (3). Defining the nature of these checkpoints and the protein molecules that regulate them is essential to understanding CTL priming and to pinpoint areas to therapeutically target CD8 T cells. Although many studies have focused on events that initially trigger naive CD8 cells to become CTLs (4, 5), the requirement for long term priming in vivo is still being debated. Recent reports suggest that CD4 help, augmenting APC activity through CD40 ligand-CD40 interactions, may allow APC to present class I-restricted peptides in a more immunogenic manner (6, 7). In contrast, data using peptides with no restriction for class II MHC, injected in adjuvant to create a high level of inflammation, or studies of certain viruses that may induce different inflammatory environments, have demonstrated that CD4 help is not obligatory for effective CTL priming (8, 9, 10). The molecular interactions that control the primary CD8 response are incompletely defined. It has been highlighted that proliferation of naive CD8 cells and development of CTL activity can be induced with only a brief period of stimulation of 2–4 h (11). This suggests that for effective long term priming, a major regulator may not be signals that govern division, but signals that dictate the survival or persistence of the functionally active CTL when initial differentiation and cell division occur. Several reports support this hypothesis (12, 13, 14). If correct, this is directly analogous to a checkpoint that we have defined in the response of CD4 T cells (15, 16, 17) that is governed by a costimulatory molecule of the TNFR family, OX40 (CD134), when it contacts its inducible ligand (OX40 ligand (OX40L)3) expressed on APC. OX40 is not constitutive on a naive CD4 T cell, but is induced >12 h after Ag recognition, with peak expression seen from 24 h onward (15). CD4 T cells lacking OX40 initially divide, but do not survive efficiently during and after the division process (15, 16). The survival defect is due to decreased levels of antiapoptotic members of the Bcl-2 family several days into the response (15). OX40 expression has also been visualized on activated CD8 T cells (18, 19, 20). Indirect data, using agonist OX40 Abs, have suggested that this molecule could play an important role in CTL priming, although in these studies it was not established whether the CD8 cell was the recipient of the OX40 signals (21, 22). Using Ag-specific naive CD8 T cells deficient in OX40 and OX40L-blocking reagents, we now show that CD8 cells initially divide in vivo and differentiate into CTL independently of OX40/OX40L interactions. However, without OX40 signals, far fewer CTLs accumulate at the peak of primary responses. Similarly, agonist Ab to OX40 inhibits the growth of tumor cells in a CD4-deficient environment by augmenting CD8 priming. These data suggest that OX40/OX40L interactions can be crucial to the effective generation of CD8 immunity. OT-I TCR transgenic mice (23) were bred on the C57BL/6 background and backcrossed to the OX40−/− background (24) to generate OT-I/OX40−/− mice. C57BL/6, B6.PLThy, and I-Ab−/− mice were purchased from The Jackson Laboratory (Bar Harbor, ME). OVA-expressing EG.7 tumor cells were obtained from American Type Culture Collection (Manassas, VA) and passaged several times in vivo before use. Vα2/Vβ5 CD8 T cells (3–5 × 106) from OT-I or OT-I/OX40−/− were injected i.v. into unirradiated wt B6 or B6.PLThy donors, as described previously (25). Recipients of transgenic T cells were injected s.c. with either PBS or 50 μg of OVA peptide 257–264 emulsified in CFA. The number of Ag-specific T cells was calculated by determining percentages of Vα2/Vβ5 CD8 cells or Thy1.1 CD8 cells after flow cytometric analyses. Cell division was either assessed with a pulse of 5-bromo-2′-deoxyuridine (BrdU; 1 mg) given i.p. 20 h before the time period examined or by prelabeling transferred T cells with CFSE. In some cases, blocking Ab to OX40L (17) or control IgG (200 μg) was given i.p on days 0 and 2. EG.7 cells (5 × 106) were injected i.p. into syngeneic C57BL/6, OX40−/−, or I-Ab−/− mice. For extraction of tumor cells and peritoneal lymphocytes, the peritoneal cavity was flushed with 20 ml of ice-cold PBS. Numbers of tumor cells were assessed by counting large (high forward/side scatter) CD8-negative cells by either trypan blue exclusion or flow cytometry. In some cases, agonist Ab to OX40 (16) or control IgG (100–200 μg) was given i.p on the indicated days. Whole lymph node and spleen cells (3 × 105) or CD4 and CD8 T cells purified by Ab-directed complement lysis were stimulated with 105 syngeneic APCs and varying concentrations of class I (257–264) or class II (323–339) OVA peptide. Cultures were pulsed with 1 μCi of [3H]thymidine (ICN Biochemicals, Irvine, CA) at 60–72 h and collected 16 h later. Supernatants were collected 30–36 h after stimulation to assess cytokine production. 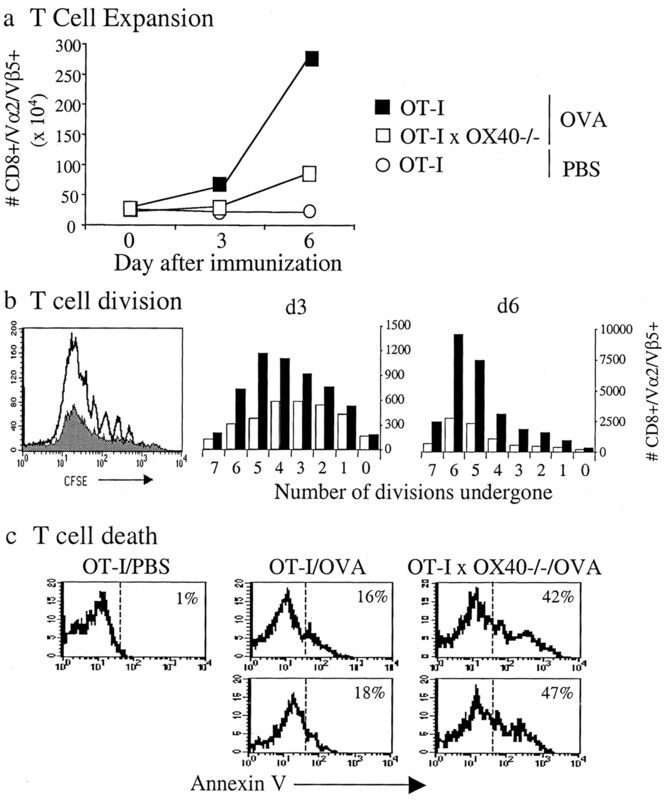 CD8 T cells were purified from recipients of adoptively transferred OT-I or OT-I/OX40−/− cells several days after in vivo challenge with peptide-CFA. Equivalent numbers of Vα2/Vβ5 CD8 T cells were used as effectors in a direct 6-h ex vivo CTL assay. Spleen or LN cells from tumor-bearing mice were stimulated in vitro with OVA peptide 257–264 for 6 days. Equivalent numbers of CD8 T cells were used as effectors in a 6-h CTL recall assay. In both cases EL-4 target cells (H-2kb; American Type Culture Collection) were labeled with 5 μCi/ml [3H]thymidine for 6 h and loaded with 1 μM OVA peptide 257–264. Specific lysis was calculated from the following formula: ((spontaneous retention − experimental retention)/spontaneous retention) × 100. OX40 signals control the survival and persistence of CD4 T cells during and after division (15, 16, 17). To show whether OX40 plays a similar role in a CD8 response, naive OT-I CD8 cells specific for OVA were adoptively transferred into syngeneic nontransgenic recipients, then tracked during the course of a response to a class I-restricted OVA peptide given in CFA. Preventing OX40 signals, with a blocking Ab to OX40L, strongly inhibited the expansion of Ag-reactive CD8 cells, with the number being reduced by ∼80% around the peak of the response and with far fewer cells persisting after the primary response was complete (Fig. 1⇓a). In vivo BrdU labeling was not significantly different in animals treated with anti-OX40L at any time point over 3 days after immunization, suggesting that OX40 signals did not primarily affect initial CD8 T cell division (Fig. 1⇓b). In contrast, far greater numbers of Ag-specific CD8 cells were observed to stain for annexin V after OX40L blockade, implying that OX40 provides signals to maintain the survival of proliferating cells. OX40/OX40L interactions control the accumulation and survival of effector CD8 T cells. Vα2/Vβ5+ CD8 T cells from OT-I mice were transferred adoptively into nontransgenic wt recipients. Mice were challenged with OVA peptide 257–264 in CFA or with only PBS and treated with control IgG or blocking anti-OX40L. a, Absolute number of transferred OT-I CD8 cells surviving over time in pooled draining LNs and spleens. b, Proportion of FACS-gated OT-I CD8 cells incorporating BrdU on days 2 and 3 after a 20-h in vivo pulse. No division was detected on day 1 (not shown). c, Proportion of FACS-gated OT-I CD8 cells staining for annexin V after 2 or 3 days. Results in a are the average ± SD of three mice per group, and those in b and c are representative plots from groups of three mice per time point. The data shown are representative of two independent experiments. 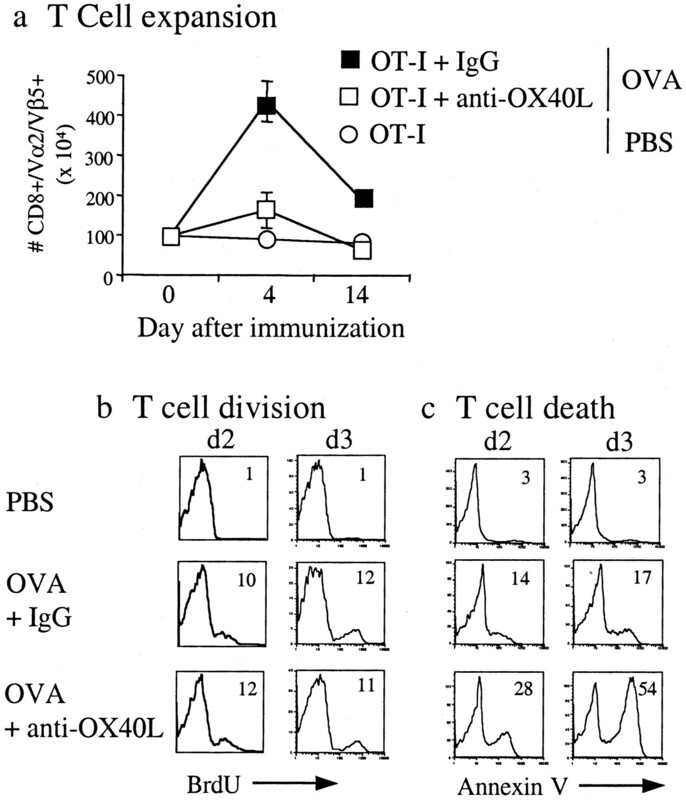 To isolate the OX40 deficiency to CD8 T cells, OT-I transgenic mice were crossed onto the OX40−/− background. Wild-type (wt) and OX40−/− OT-I cells were labeled with CFSE and adoptively transferred into wt recipients. Directly reproducing the blocking results, the increase in primed OX40−/− CD8 cells was significantly less after immunization with peptide in CFA (reduced by 70–80%; Fig. 2⇓a). Cells from the transferred populations were found to have undergone up to seven divisions regardless of the presence or the absence of OX40 (Fig. 2⇓b). However, fewer cells in each division were noted with the OX40−/− population (Fig. 2⇓b), and this correlated with enhanced numbers of CD8 cells undergoing apoptotic cell death as measured by annexin V staining (Fig. 2⇓c). These results indicate that OX40 expressed on the CD8 cell can play an important role in the primary response, largely controlling the survival of these T cells during the initial proliferative phase. This is identical with our previous conclusions regarding a role for OX40 on CD4 cells (15, 17). OX40 is directly required by responding CD8 T cells. CFSE-labeled Vα2/Vβ5+ CD8 T cells from wt OT-I or OX40−/− OT-I mice were transferred adoptively into nontransgenic wt recipients. Mice were challenged with OVA peptide in CFA or with only PBS. a, Absolute number of transferred wt and OX40−/− CD8 cells recovered in pooled draining lymph nodes and spleens on days 3 and 6. b: Left, CFSE profile of wt OT-I (□) and OX40−/− OT-I cells (▪) on day 6 after priming; middle and right, quantitation of CFSE data on days 3 and 6 in terms of the number of cells found in each division. Results are the mean ± SD from three mice per group per time point and are representative of two independent experiments. c, Proportion of FACS-gated OT-I CD8 cells staining for annexin V after 3 days. Two individual T cell populations are shown from mice primed with OVA. Six days after immunization, an in vitro recall response occurred. Peptide-specific proliferation was significantly weaker in mice receiving OX40−/− CD8 cells compared with that in mice receiving wt CD8 cells, approximating the difference in the number of Ag-reactive T cells in each group (Fig. 3⇓a). Ex vivo CTL activity, adjusted to equalize the number of effector TCR transgenic CD8 T cells, did not show any alteration in the killing capability of primed OX40−/− cells (Fig. 3⇓b). Collectively, this suggests that OX40 signals do not contribute to the ability of CD8 cells to initially respond and develop cytotoxicity, but primarily control the number of CTLs that survive the expansion period. OX40 costimulation controls the number of CTL generated, but not the development of cytotoxicity. Vα2/Vβ5+ CD8 T cells from OT-I or OX40−/− OT-I mice were transferred into wt recipients as described in Fig. 2⇑. Mice were challenged with OVA peptide in CFA, and reactivity was assessed in vitro 6 days after priming. a, Proliferation of wt OT-I (▪) and OX40−/− OT-I cells (□) in response to varying doses of OVA peptide. b, Direct ex vivo cytotoxicity, measured from equal numbers of Vα2/Vβ5+ CD8 T cells, using OVA-peptide pulsed EL-4 targets. Results are the mean ± SD obtained from three mice per group and are representative of two independent experiments. To further define a physiological role for OX40, we assessed whether OX40/OX40L interactions were active in the CD8 T cell response to tumor. The thymoma E.G7 expresses the class I molecule Kb, but not class II, and bears a low number of Kb/OVA complexes per cell, potentially mimicking the expression of Ag on a physiologically relevant tumor. Showing a role for OX40/OX40L interactions, OX40−/− mice displayed accelerated tumor growth over time (Fig. 4⇓a). Similar to results previously described (26), a strong tumor-specific CD4 response and a weaker CD8 response were observed in wt mice between days 5 and 10. Correlating with enhanced tumor growth, a lack of both CD4 and CD8 responses was seen in OX40−/− mice, as measured by proliferation or cytokine production (Fig. 4⇓, b and c). CTL activity, measured in a 6-day recall cytotoxic assay to compensate for any differences in numbers of Ag-specific CD8 cells, was not significantly affected in the absence of OX40 (Fig. 4⇓d). This shows that endogenous OX40 signals can play a role in an antitumor CD8 T cell response, again most likely through regulating the accumulation of tumor-reactive T cells. OX40−/− mice show enhanced tumor growth and reduced T cell responses to tumor Ags. OX40−/− mice (□) or syngeneic C57BL/6 mice (▪) were injected with 5 × 106 EG.7 tumor cells i.p. a, Tumor numbers in peritoneal washes on days 10 and 20. b, CD8 T cell proliferation and IL-2 production (inset) in response to OVA peptide 257–264 in vitro on day 10. c, CD4 T cell proliferation in response to OVA peptide 323–339 in vitro on day 10. d, Six-day recall CTL assay on day 10 using OVA peptide 257–264-pulsed EL-4 targets. Results are the mean ± SD from 5 to 10 mice/group and are representative of four independent experiments. Although a T cell response is initially induced during the growth of E.G7 tumor cells, wt mice still succumb to the tumor and are not protected over time (26). To test whether prolonged OX40 signals can regulate effective CD8 priming, agonist anti-OX40 was injected on varying days after inoculation with EG.7 cells. Tumor numbers were dramatically reduced with anti-OX40 treatment, even when given up to 10 days after tumor establishment (Fig. 5⇓a). Anti-OX40 was not directly toxic to EG.7 cells, as no antitumor activity was seen if tumors were injected into OX40-deficient mice (data not shown). The reduction in tumor load with anti-OX40 corresponded with strong CD4 (Fig. 5⇓b) and CD8 (Fig. 5⇓c) recall responses to Ag 20 days after tumor inoculation, a time when T cell responses in control mice had diminished. Similar to data from our other systems, CTL activity was unchanged in mice receiving anti-OX40 (Fig. 5⇓d). OX40 signals augment antitumor CD8 immunity in the absence of CD4 T cells. EG.7 tumor cells (5 × 106) were injected i.p. into wt C57BL/6 mice (a–d) or CD4-deficient MHC class II−/− BL/6 mice (e and f). a, Number of tumor cells in peritoneal washes on day 20 in wt mice treated with control Ig (□) or agonist anti-OX40 (▪) given on day 2, 4, or 10. b and c, Proliferation on day 20 from purified CD4 T cells (b) and purified CD8 T cells (c) stimulated with the relevant OVA peptides in vitro from wt mice treated with Ab on day 6. d, Six-day recall CTL assay on day 10 for wt mice treated with Ab on day 3 using OVA peptide 257–264-pulsed EL-4 targets. e, Tumor numbers in peritoneal washes from MHC class II−/− mice on day 25 after treatment with control Ig (□) or anti-OX40 (▪). f, Recall CD8 T cell proliferation in MHC class II−/− mice on day 25 after in vitro stimulation with OVA peptide 257–264 from control Ig-treated (□) or anti-OX40-treated (▪) groups. Results are mean of 5 to 10 mice per group and are representative of two to four experiments. To address whether the protective anti-OX40 action was mediated through CD4 cells, tumors were induced in MHC class II-deficient mice that lack these T cells. Tumor numbers were still greatly reduced after anti-OX40 treatment (Fig. 5⇑d), and this was accompanied by strong CD8 recall reactivity (Fig. 5⇑e). Thus, the provision of OX40 signals can act as a checkpoint in the CTL response, and OX40 signals can control the effective development of CD8 T cell immunity. Many studies over the years have highlighted how strongly CD8 responses are regulated. However, the molecular basis of this regulation is still not completely defined. Our present data show that the OX40-OX40L interaction is one component determining whether effective CD8 immunity can be elicited. Although CD8 T cells will undergo clonal expansion even with a brief antigenic stimulation (11), these signals are not sufficient to sustain prolonged responses (14). The data reported in this study suggest that a checkpoint exists, regulated by signals such as those from OX40, which occurs subsequent to the initial activation event and governs the accumulation and survival of CD8 T cells over the course of the primary immune response. Until now a direct role for OX40 on CD8 T cells has not been established. A previous report, using OX40-deficient mice, showed that CD8 priming was normal after lymphocytic choriomeningitis virus (LCMV) infection (27), although it is was not demonstrated in this case whether OX40 was induced on CD8 T cells under the conditions of LCMV-induced inflammation. In contrast, two reports using agonist Abs to OX40 did show augmented CD8 responses, but in each case it was not established whether the CD8 cell was the recipient of the OX40 signals (21, 22). One role of OX40 in CD8 responses could be to augment CD4 help. Although we believe this is possible, as OX40 can strongly control the extent of the primary CD4 response (15, 16), by using OX40-deficient cells responding in a wt environment in our adoptive transfer experiments we very clearly establish a direct role for OX40 on the CD8 T cell. Identical with our previous results on CD4 T cells (15, 17), OX40 seems to principally control the survival of CD8 T cells, but does not appear to influence the cytotoxic or functional capacity of CD8 T cells. We additionally show in this study that prolonged signaling through OX40, using an agonist Ab, can generate a protective CD8 T cell response to tumor Ags in a situation where OX40/OX40L interactions are initially active, but obviously not sufficient for protection. This suggests that sustained signaling through this molecule may be crucial in some situations to allow a long-lasting primary CD8 response. As well as OX40, the TNFR molecules 4-1BB, CD27, and CD30 are also costimulatory for T cells. Reports of 4-1BBL−/− mice have demonstrated defective CD8 responses to LCMV, influenza virus, and LCMV peptides (28, 29, 30). By tracking Ag-specific CD8 cells, it was shown that 4-1BB signals are also not required for initial cell division, but, like OX40, are required for the accumulation of high numbers of primed CTL over time (25). Similarly, the reduced CTL response to influenza was shown to be at the level of persistence of T cells late in the primary response and to result in a weakened ability of the resultant memory CD8 cells to respond again to recall Ag (30, 31). Complimentary data have also been described in systems using agonist Abs, in which provision of 4-1BB signals replaced the need for CD4 cells in an antitumor CD8 response that was normally dependent on CD4 help (32). These data clearly suggest parallels between 4-1BB and OX40 and indicate that each can play an important role in maintaining CD8 cell numbers and/or reactivity over time. Studies of CD27/CD70 and CD30/CD30 ligand interactions have also suggested links to OX40 and 4-1BB. A reduction in the frequency of memory CD8 T cells was seen in CD27−/− mice responding to influenza (33), and a study tracking adoptively transferred OT-I CD8 cells in CD30 ligand−/− mice, in a response to tumor-derived OVA peptides, also demonstrated that CD30 signals were essential for accumulation of high numbers of primary effector and memory cells (34). Together these reports suggest that the expression of costimulatory members of the TNFR/TNF family plays an important role in determining the final outcome of CD8 T cell activation in terms of prolonged responses. CD27 is constitutively expressed on naive T cells at low levels, but is up-regulated shortly after activation (35, 36). This is followed hours to days later by the expression of OX40, 4-1BB, and CD30. The exact timing of appearance of each molecule has not been studied in relation to the other family members, nor has it been determined whether each is expressed during all CD8 responses or whether single interactions become dominant depending on the nature of the Ag and the inflammatory environment created. As the latter molecules and all their ligands need to be induced, the level and timing of expression may be critical factors in determining the strength of signal available for the development and persistence of the CD8 T cell response. Further studies delineating conditions required for maximal and sustained expression of TNFR family members and their ligands will shed more light on this checkpoint that regulates the survival and responsiveness of CD8 T cells. ↵1 This work was supported by National Institutes of Health Grant CA91837 and a Research Scholar Grant from the American Cancer Society (to M.C.). This is manuscript 561 from La Jolla Institute for Allergy and Immunology. ↵3 Abbreviations used in this paper: OX40L, OX40 ligand; BrdU, 5-bromo-2′-deoxyuridine; LCMV, lymphocytic choriomeningitis virus; wt, wild type. Harty, J. T., A. R. Tvinnereim, D. W. White. 2000. CD8+ T cell effector mechanisms in resistance to infection. Annu. Rev. Immunol. 18:275. Sprent, J., D. F. Tough. 2001. T cell death and memory. Science 293:245. Cai, Z., A. B. Brunmark, A. T. Luxembourg, K. C. Garcia, M. Degano, L. Teyton, I. Wilson, P. A. Peterson, J. Sprent, M. R. Jackson. 1998. Probing the activation requirements for naive CD8+ T cells with Drosophila cell transfectants as antigen presenting cells. Immunol. Rev. 165:249. Ridge, J. P., F. Di Rosa, P. Matzinger. 1998. A conditioned dendritic cell can be a temporal bridge between a CD4+ T-helper and a T-killer cell. Nature 393:474. Schoenberger, S. P., R. E. Toes, E. I. van der Voort, R. Offringa, C. J. Melief. 1998. T-cell help for cytotoxic T lymphocytes is mediated by CD40-CD40L interactions. Nature 393:480. Buller, R. M., K. L. Holmes, A. Hugin, T. N. Frederickson, H. C. Morse, 3 rd. 1987. Induction of cytotoxic T-cell responses in vivo in the absence of CD4 helper cells. Nature 328:77. Aichele, P., H. Hengartner, R. M. Zinkernagel, M. Schulz. 1990. Antiviral cytotoxic T cell response induced by in vivo priming with a free synthetic peptide. J. Exp. Med. 171:1815. Franco, A., D. A. Tilly, I. Gramaglia, M. Croft, L. Cipolla, M. Meldal, H. M. Grey. 2000. Epitope affinity for MHC class I determines helper requirement for CTL priming. Nat. Immunol. 1:145.
van Stipdonk, M. J., E. E. Lemmens, S. P. Schoenberger. 2001. Naive CTLs require a single brief period of antigenic stimulation for clonal expansion and differentiation. Nat. Immunol. 2:423. Kurts, C., F. R. Carbone, M. Barnden, E. Blanas, J. Allison, W. R. Heath, J. F. Miller. 1997. CD4+ T cell help impairs CD8+ T cell deletion induced by cross-presentation of self-antigens and favors autoimmunity. J. Exp. Med. 186:2057.
van Stipdonk, M. J., G. Hardenberg, M. S. Bijker, E. E. Lemmens, N. M. Droin, D. R. Green, S. P. Schoenberger. 2003. Dynamic programming of CD8+ T lymphocyte responses. Nat. Immunol. 4:361. Gramaglia, I., A. Jember, S. D. Pippig, A. D. Weinberg, N. Killeen, M. Croft. 2000. The OX40 costimulatory receptor determines the development of CD4 memory by regulating primary clonal expansion. J. Immunol. 165:3043. Salek-Ardakani, S., J. Song, B. S. Halteman, A. G. Jember, H. Akiba, H. Yagita, M. Croft. 2003. OX40 (CD134) controls memory T helper 2 cells that drive lung inflammation. J. Exp. Med. 198:315. Baum, P. R., R. B. Gayle, F. Ramsdell, S. Srinivasan, R. A. Sorensen, M. L. Watson, M. F. Seldin, E. Baker, G. R. Sutherland, K. N. Clifford, et al 1994. Molecular characterization of murine and human OX40/OX40 ligand systems: identification of a human OX40 ligand as the HTLV-1-regulated protein gp34. EMBO J. 13:3992. Al-Shamkhani, A., M. L. Birkeland, M. Puklavec, M. H. Brown, W. James, A. N. Barclay. 1996. OX40 is differentially expressed on activated rat and mouse T cells and is the sole receptor for the OX40 ligand. Eur. J. Immunol. 26:1695. Wang, H. C., J. R. Klein. 2001. Multiple levels of activation of murine CD8+ intraepithelial lymphocytes defined by OX40 (CD134) expression: effects on cell-mediated cytotoxicity, IFN-γ, and IL-10 regulation. J. Immunol. 167:6717. De Smedt, T., J. Smith, P. Baum, W. Fanslow, E. Butz, C. Maliszewski. 2002. Ox40 costimulation enhances the development of T cell responses induced by dendritic cells in vivo. J. Immunol. 168:661. Pippig, S. D., C. Pena-Rossi, J. Long, W. R. Godfrey, D. J. Fowell, S. L. Reiner, M. L. Birkeland, R. M. Locksley, A. N. Barclay, N. Killeen. 1999. Robust B cell immunity but impaired T cell proliferation in the absence of CD134 (OX40). J. Immunol. 163:6520.
Cooper, D., P. Bansal-Pakala, M. Croft. 2002. 41BB (CD137) controls the clonal expansion and survival of CD8 T cells in vivo but does not contribute to the development of cytotoxicity. Eur. J. Immunol. 32:521. Shrikant, P., M. F. Mescher. 1999. Control of syngeneic tumor growth by activation of CD8+ T cells: efficacy is limited by migration away from the site and induction of nonresponsiveness. J. Immunol. 162:2858. Kopf, M., C. Ruedl, N. Schmitz, A. Gallimore, K. Lefrang, B. Ecabert, B. Odermatt, M. F. Bachmann. 1999. OX40-deficient mice are defective in Th cell proliferation but are competent in generating B cell and CTL responses after virus infection. Immunity 11:699. Tan, J. T., J. K. Whitmire, R. Ahmed, T. C. Pearson, C. P. Larsen. 1999. 4-1BB ligand, a member of the TNF family, is important for the generation of antiviral CD8 T cell responses. J. Immunol. 163:4859. DeBenedette, M. A., T. Wen, M. F. Bachmann, P. S. Ohashi, B. H. Barber, K. L. Stocking, J. J. Peschon, T. H. Watts. 1999. Analysis of 4-1BB ligand (4-1BBL)-deficient mice and of mice lacking both 4-1BBL and CD28 reveals a role for 4-1BBL in skin allograft rejection and in the cytotoxic T cell response to influenza virus. J. Immunol. 163:4833. Tan, J. T., J. K. Whitmire, K. Murali-Krishna, R. Ahmed, J. D. Altman, R. S. Mittler, A. Sette, T. C. Pearson, C. P. Larsen. 2000. 4-1BB costimulation is required for protective anti-viral immunity after peptide vaccination. J. Immunol. 164:2320. Bertram, E. M., P. Lau, T. H. Watts. 2002. Temporal segregation of 4-1BB versus CD28-mediated costimulation: 4-1BB ligand influences T cell numbers late in the primary response and regulates the size of the T cell memory response following influenza infection. J. Immunol. 168:3777. Diehl, L., G. J. van Mierlo, A. T. den Boer, E. van Der Voort, M. Fransen, L. van Bostelen, P. Krimpenfort, C. J. Melief, R. Mittler, R. E. Toes, et al 2002. In vivo triggering through 4-1BB enables Th-independent priming of CTL in the presence of an intact CD28 costimulatory pathway. J. Immunol. 168:3755. Podack, E. R., N. Strbo, V. Sotosec, H. Muta. 2002. CD30-governor of memory T cells?. Ann. NY Acad. Sci. 975:101. Hintzen, R. Q., J. R. de, S. M. Lens, R. Van Lier. 1994. CD27: marker and mediator of T-cell activation?. Immunol. Today 15:307.